The Service Packages (also referred to as Support Modules or Support Solutions) can be requested to support humanitarian actors such as the UN, Red Cross / Red Crescent, the EU, NGOs and other humanitarian organisations in response to emergencies. The Service Package concept refers to combination of specialised and rapidly deployable equipment together with the required experts specially trained on the equipment. In support of the requester, IHP delivers the requested Service Package, sets it up, operates, ensures daily running of the service as well as eventual handover or transport back to origin. Service Packages provide technical and logistical services when capacity is limited or existing facilities, capacity and infrastructure is incapacitated. All IHP Service Packages are bespoke, meaning that they are flexible in size and function and will be adjusted as per the requesting organisation’s needs and requirements as well as fitting into the situational requirements in the field. You can find detailed information about each Service Package in the banners below. Purpose: The purpose of the ICT Service Package is to assist humanitarian organisations to carry out operations efficiently and effectively, through providing timely and predictable ICT services. 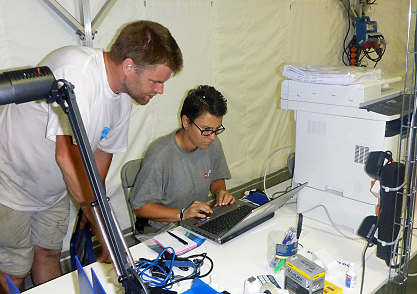 The ICT services supports humanitarian coordination and response, an operational security environment for staff, and support decision making through enabling of dissemination of critical information. A smaller package supporting a standard first responder team, for example an UNDAC team or equivalent emergency response team. The service includes basic communications, internet access, and office services etc. and allows the team to operate from different locations. The ICT service may also complement Reception and Departure Centres (RDC). The module is normally accompanied by 2 experts who install the equipment, ensure maintenance, provides user support, and general practical and logistical support. A larger package supporting longer term missions and larger teams, i.e. OSOCCs (coordination centres), agencies’ office facilities, base camps etc. The service includes all necessary telecommunications, wireless internet, office services etc. and works in all types of facilities (e.g. tented, pre-fabs, hard shelter or any combination). The module is normally accompanied by a minimum of 2-4 experts who install the equipment, ensure maintenance, provides user support, and general practical and logistical support. Purpose: in emergencies where the security situation demands UN MOSS compliancy, the ICT module can be supplemented to ensure that all staff members meet minimum safety standards. Service: The module is adapted to each UN security system and is prepared on a case-by-case basis. It consists of VHF radios, base stations, GPS, satellite phones, and can be further supplemented with personal protective equipment if required. Purpose: The purpose of the coordination centres (for example On-site Operations and Coordination Centre – OSOCC, general coordination or management facilities etc.) are to assist the establishment of humanitarian coordination structures and facilitate efficient and effective coordination in relief operations. Service: Provision of necessary infrastructure with workstations to enable humanitarian staff to coordinate and manage programmes efficiently. Additional to the IHP experts, the module can encompass general office facilities, work stations, power supply, high-speed internet access, wireless LAN, laser printer and photocopier, Wi-Fi and other communications technology etc. Service: Provision of necessary infrastructure with workstations to enable humanitarian staff to coordinate and manage programmes efficiently. Additional to the IHP experts, the module can encompass general office facilities, work stations, power supply, high-speed internet access, wireless LAN, laser printer and photocopier, Wi-Fi and other communications technology etc. 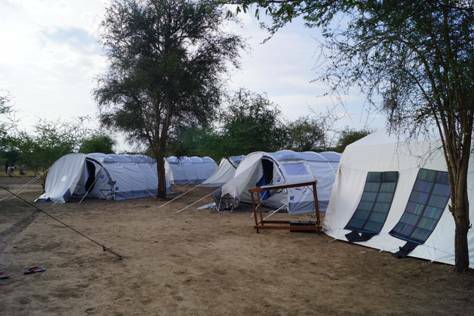 The coordination centre is housed in tents, prefabs, existing buildings, or a mixture of these, depending on the available resources and the situation on the ground. The coordination centre solution is a bespoke design established on the specific request requirements as well as the actual situation on the ground. Staffing: The module is deployed with a minimum two support staff to establish the facilities and infrastructure and provide regular maintenance. Larger facilities will often have more staff especially at the beginning when the facilities are established. Purpose: The coordination centre may be supplemented with specialized operational support staff to support coordination and information management. Services: The operational support staff can perform duties such as keeping information display updated, prepare operational plans briefings, organize internal information sharing, prepare hand-out material (maps, reports, briefings etc. ), support the OSOCC reception desk, assist with logistical planning, coordinate with external resource providers, and manage the OSOCC log. Staffing: two or more operational support staff members who have received specialized training in OSSOC/Coordination Centre and operations support management. Purpose: The purpose of the Light Base Camp is to support humanitarian organisations to rapidly establish relief activities to respond to emergencies by providing or enhancing living and working conditions for humanitarian staff. Service: The Light Base Camp is a basic tented concept providing basic services during a short time frame, normally 2-8 weeks. The concept may include accommodation, offices, catering services, water and sanitation facilities, communication and IT equipment and logistics services. The Light Base Camp can supplement a coordination centre. Note: The Light Base Camp module should not be confused with the Base Camp that provides a much more robust and a higher standard of support in longer term operations. Purpose: The purpose of the Base Camp is to assist humanitarian organizations to rapidly establish relief activities to respond to emergencies, by providing or enhancing longer term living and working conditions for humanitarian staff. Service: The Base Camp is a comprehensive high feature durable quality tented concept for office and accommodation facilities, including all necessary equipment and services. The concept may include office, accommodation, meeting rooms, water and sanitation facilities, kitchen and catering service, tools and equipment, water purification and distribution, power supply and distribution etc. IHP in Sierra Leone 2014-15 – link to IHP’s Ebola operation in Sierra Leone with Base Camp at the end. The Base Camp provides sleeping areas with personal privacy, offices with appropriate work stations, catering service (three healthy and balanced meals per day and water). Staffing: The Base Camp and its support staff are self-sufficient in regards to food and water for an initial period of at least 14 days. Purpose: The purpose of the prefabricated facilities is to assist humanitarian organizations in establishing relief activities in response to emergencies by providing or enhancing living and working conditions of humanitarian personnel. Service: The concept is a comprehensive high feature solution including prefabricated facilities that flat-packed in sea containers for transport (can be air lifted if needed). The concept includes office, communications and IT, accommodation, sanitary facilities, kitchen, tools and equipment, water purification and distribution, power supply and distribution, heating or air con etc. The concept is flexible in size and can be adjusted to the requirements of the request and the field. Staffing: A team of experts will accompany the equipment to assemble, provide maintenance and handover the facilities to requesting organisation. Purpose: The purpose of the logistics services is to ensure rapid deployment of IHP’s or other organisations’ equipment and staff to the emergency location through the provision of reliable and appropriate transport capacity. Services: The services may take the form of either air, land or sea transport through established framework agreements with commercial actors. Logistics components may also be included as supplementary elements to other Service Packages, IHP, for example, has light vehicles, 4x4 vehicles, light armoured vehicles as well as loading and lifting equipment which can be deployed.Services: The services may take the form of either air, land or sea transport through established framework agreements with commercial actors. Logistics components may also be included as supplementary elements to other Service Packages, IHP, for example, has light vehicles, 4x4 vehicles, light armoured vehicles as well as loading and lifting equipment which can be deployed.All IHP vehicles are equipped with full communications equipment with VHF, HF, and GPS handheld receivers as well as a basic maintenance kit.